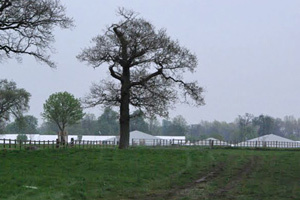 While attending Badminton Horse Trials wasn’t the sole purpose of undertaking the long journey from New Zealand to England, it certainly played a considerable influence on deciding to go at this time of the year. I could have gone later in the year when summer had officially arrived, and perhaps coincided it with the Burghley Horse Trials, but it’s Olympic Year, and Badminton was a huge part of the build up. It had the potential to be a great competition; there would be so many riders pushing for selection for their national teams, Toddy was defending his title with plenty of other kiwi riders competing and it would be a great chance to fine-tune our coverage of the Olympics on behalf of Eventing New Zealand. So, that decision being made, I planned my activities around the event and headed off in great anticipation, media accreditation granted, Twitter account and Facebook sorted, with iphone and camera gear ready for action. I had a few days in Ireland first, catching up with some great friends. A day out at the local point to point was interesting, despite the wind chill being enough to freeze one’s knees solid. It was as I prepared to get on the plane to come back to England that I heard the news. At first I thought that person was pulling my leg, but then (thanks to Twitter and IPhone) soon found out that it was true. You could have knocked me over with a baggage trolley. It was too early in the day to go to the bar for a restorative refreshment, and the coffee bar unfortunately didn’t serve Irish Coffees. Well I suppose they did (without the extras) but the one I had didn’t make me feel any better. The hour’s flight back to the UK gave me time to think about my various options, and about the implications for all those other people who thought they were going to spend a few days doing equestrian activities in Gloucester over the Bank holiday weekend. Firstly the riders. For so many it was going to be their opportunity to be realise a dream and get noticed by the selectors. One of these is Jonelle Richards, who is an outside chance for the Olympics, but with a good result at Badminton, could have put a bit of pressure on. Then there were the likes of those who were travelling from Europe, or USA especially for the event. And of course all those riders who had planned every detail of their horses’s preparation so that they would be at their best for the event. All to no avail and now there was a mad scramble to get entries into other events, and make decisions about their horses’ futures. Then you have all the retailers who I was intending meeting at some stage in the next few days. Buying in all that stock, or ingredients, getting the signage sorted out, the transport, the staffing; again, all in vain. As well as the retailers, there were the people like photographers who would only earn money if the event was on and they got the good photos. And then of course you have the spectators who may have come from just down the road, or travelled thousands of miles. For many, they would have saved long and hard for this event, planned their trip for years, and perhaps their first (and only?) opportunity to go to one of the greatest horse events. I console myself thinking I had been to Badminton before, twice, and perhaps maybe one day I will get to go again, although now I am thinking Burghley may be a better future option. So, here I was, with a spare bank holiday in England, with my rental car and a booking for a cottage near where the BHT are held (which luckily was able to be sublet for the weekend but not for the couple of days during the week). After visiting the relatives in various parts of southern England, it was to this cottage I went with the friends that were sharing it with me. We had a tiki-tour around Badminton estate and while we couldn’t go in, we could see all the mud, the puddles, the lakes, and the very, very damp ground. To add to this, it hasn’t stopped raining since we arrived in the area. I took a few photos to share with you.